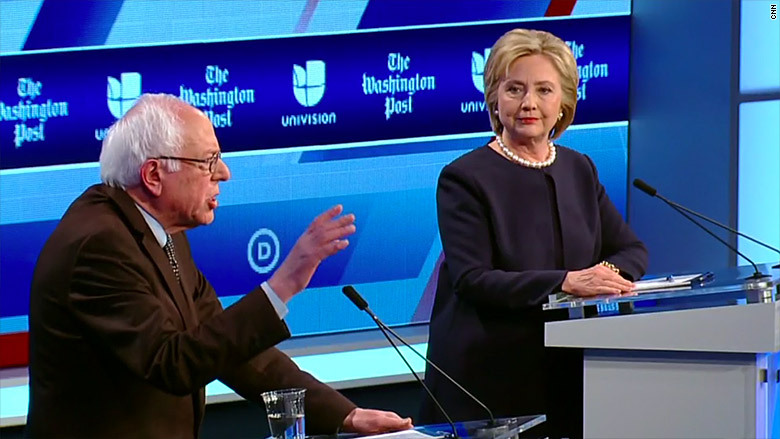 Bernie Sanders and Hillary Clinton on the debate aired by Univision and CNN. About 6 million people tuned in for Wednesday night's Democratic debate on a busy, ultra-competitive night of cable news programming. The Hillary Clinton-Bernie Sanders meet-up was broadcast by Univision, where it averaged about 2 million viewers, and simulcast by CNN, where it averaged 3.94 million. The result was on par with the Clinton-Sanders debate on Sunday in Flint, Michigan. That two-hour match-up averaged 5.5 million viewers just on CNN. Wednesday's debate was also live-streamed on The Washington Post's web site and shown on Univision's Fusion cable channel, but no viewership data was available for those sources. At this point in the primary election season, there's a loyal audience of Democratic debate viewers, but the debates aren't causing the kinds of ratings spikes that are seen on the GOP side. The most recent GOP debate drew almost 17 million viewers to Fox News last week. The next GOP debate will take place on CNN on Thursday night. Fox News promoted one-on-one interviews with all four GOP contenders as a sort of counter-programming to Univision and CNN. The Fox interviews may have lured away some debate watchers, but not all that many. Fox's prime time ratings were somewhat above average, but not up dramatically. Greta Van Susteren interviewing John Kasich in the 7 p.m. hour was up first, and it averaged 2.1 million viewers. Of the foursome, Donald Trump was — not surprisingly — was the biggest viewer draw. His amicable chat with Sean Hannity in the 10 p.m. hour averaged 2.6 million viewers. Megyn Kelly's interview of Ted Cruz an hour earlier averaged 2.4 million. The Democratic debate ended at 11 p.m. Viewers didn't stay up for Kelly's interview with Marco Rubio in that hour — it averaged just 1.5 million viewers. Nor were viewers particularly interested in MSNBC's 8 p.m. town hall with Rubio, either. That hour-long special averaged 735,000 total viewers. The 8 p.m. hour of "Anderson Cooper 360" on CNN, which featured an interview with Trump, had twice as many viewers, 1.56 million overall.